- 03 Apr 2019, 01:36 #16785 HDMI eARC has mandatory built-in lipsync correction. A given TV may or may not support decoding of various audio formats but eARC is agnostic. It should just pass-through whatever bitstream you input - at least that's the basic idea. - 03 Apr 2019, 03:03 #16786 Thanks Rasmus for asking the questions. I have to say that the level of opacity of TV manufacturers on technical details of their sets is kind of disgrace. And I find it disrespectful toward both consumers and specialized press. I understand not focusing their mass communication on tech detail that a minor percentage would understand. But in a dedicated event not having people knowledgeable on their products... not so much. A good BFI implementation was my main point of interest for the 9 Series of OLED. Lack of information on how the implementation that ended up in actual TV sets works is stopping me from buying. As there were four settings available (off, low, medium, high), going to a simple "on/off" setting should be properly explained as far as what exactly the setting does with different frame rates. Rasmus Larsen wrote: HDMI eARC has mandatory built-in lipsync correction. A given TV may or may not support decoding of various audio formats but eARC is agnostic. It should just pass-through whatever bitstream you input - at least that's the basic idea. I honestly don't know where the information has been sourced from but TOSLink is capable of transmitting full bitrate DTS (1535 Kbits), so I can assure you that the 384 Kbits limit is wrong, from personal experience. - 04 Apr 2019, 21:19 #16792 Well to be fair, I didn't ask them about the new on/off BFI setting because I wasn't aware that they had changed it. I didn't see your post until after the event. I also think it is worth pointing out that most of the engineers are Koreans. They usually divide tasks so some people work specifically on motion, others on HDMI implementation, others on calibration etc. Only a few of the people involved are present for these types of events. We have some follow up requests with LG so we hope to learn more in time. 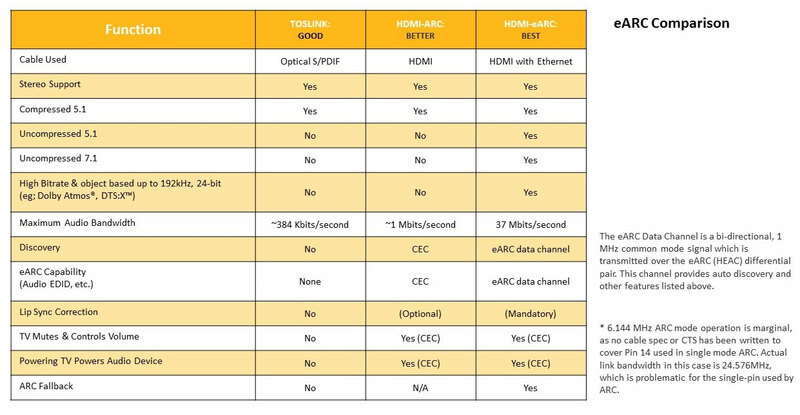 The eARC comparison is from the HDMI group. It relates specifically to TVs, so it references TOSLink implementation in TVs.